Sensory hair cells (blue) in the inner ear convert sound into neural impulses that are transmitted to the brain via the auditory neurons (green - arrowhead). 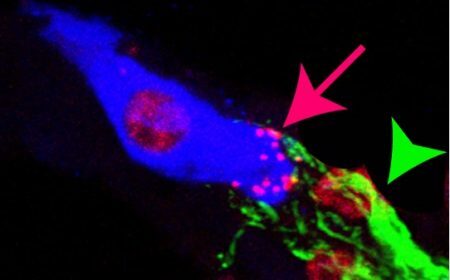 The delicate connections that link the hair cells to the neurons (red - arrow) are highly susceptible to damage. This project is developing a new therapeutic approach to restore these vital connections to treat hearing loss from noise exposure. Most people are likely to have damaged the sensitive connections (called synapses) between the auditory neurons and sensory hair cells in the inner ear. The effects of losing these synaptic connections are typically noticeable in difficult listening conditions such as a noisy restaurant. You'll be disappointed to learn from your doctor that there are no therapeutic options for you. Unfortunately this condition is likely to worsen over time with the loss of sensory hair cells themselves causing further hearing difficulties. Our research has developed a novel strategy to deliver a drug called neurotrophins that can repair lost synaptic connections. However, in order to translate this exciting research to the clinic, we need data from a number of key experiments described in this project. This project will deliver these key outcomes by establishing the most effective way of administering the drug delivery system and measuring improvements in how the brain can process sound information following treatment. This study will define the clinical population most suited to a first in human trial of this technology and in doing so, gain industry investment to meet this clinical need.